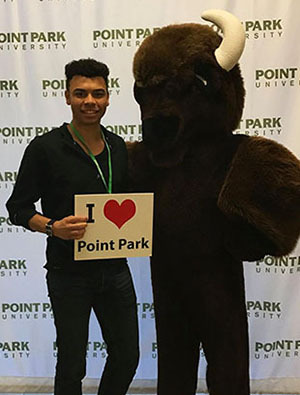 Point Park University is welcoming one of its largest incoming classes this fall semester, with more than 900 U.S. and international freshmen and transfer students and approximately 800 online students. From California and Connecticut to Germany and Qatar, Point Park's new students represent 35 states and 12 foreign countries. Freshman applications are up 16 percent from last year and total applications for new students (freshmen, transfer and international) are at an all-time high of 5,599. Moreover, there has been an 11 percent increase in freshman deposits over the last two years. "The demand for a Point Park University education has never been higher," according to Trudy Williams, Point Park University acting vice president for enrollment management. "We are immersed in the heart of Downtown Pittsburgh, one of America's greatest cities. This dynamic environment gives our students opportunities for experiential learning, internships and jobs while learning from faculty who work in the field. The combination of an affordable cost, a relevant, career-focused education and successful career outcomes adds up to Point Park being a great value," Williams added. With the incoming class, Point Park University has over 4,200 total students enrolled this fall in 79 majors, 18 master's degree programs and three doctoral programs. Additionally, the University has approximately 50 student clubs and organizations on campus and is welcoming more than 100 new student athletes to its 17 men's and women's varsity sports, which include track and field and competitive cheer and dance teams. Point Park University has more 27,000 alumni in all 50 states and 42 countries around the world. Request information, schedule a campus visit or apply online to Point Park University.